Rainforest Cafe in Disney's Animal Kingdom theme park brings adventure to the lunch and dinner table with outstanding American cuisine that includes luscious salads, pasta, sandwiches, seafood, burgers and poultry dishes, as well as a variety of vegetarian selections. Top off your dining safari with a signature dessert such as the Journey's End Sparkling Volcano, a chocolate brownie tower topped with ice cream, whipped cream and caramel and chocolate sauces-it's erupting with sweet goodness! 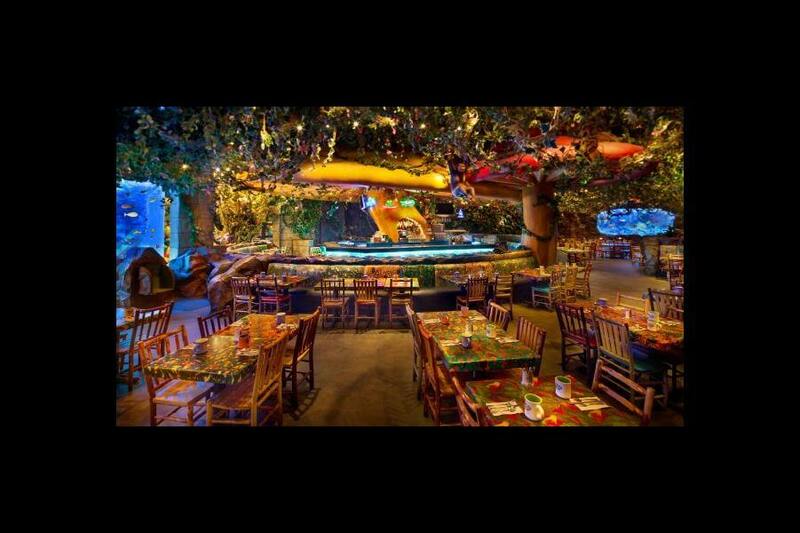 The Rainforest Cafe also serves breakfast with traditional favorites that include cinnamon toast lathered in fresh fruit and warm maple syrup, eggs Benedict, scrambled eggs and omelettes. Reservations are recommended for this popular themed restaurant where animated animals recite facts about the rainforest as the sky claps with the boom of simulated thunder and sudden rainstorms. (Don't worry-you won't get wet!) Lush vegetation, banyan trees, waterfalls, trumpeting elephants and chest-pounding gorillas round out the rich jungle ambience. Don't forget to visit the large themed gift shop after your meal to find a unique souvenir.